Total of these six Words is:4+3+2+2+4+3=18. 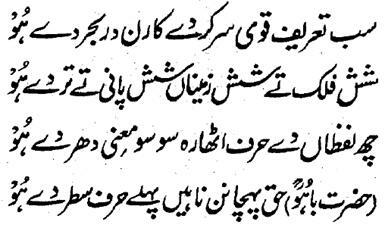 Those people, who have studied the books of the Sultan ul Arifeen Hazrat Sultan Bahu Rahmatu-Allahe Ta-aala Alaihe , they would surely be knowing the reality and significance of these at least a bit. He has give the status of the Keys of the Treasuries of Worlds and the Keys of the Unseen Treasures of the Quarters of World to these Sacred Words in his Persian books. At the end, he says that 'O Bahu Rahmatu-Allahe Ta-aala Alaihe ! 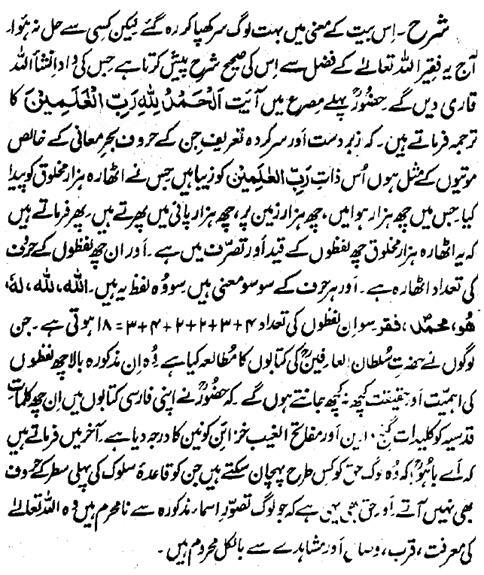 how those, who are unaware of the Words of the first line of the Discipline of Salook, can identify Haq? Moreover, it is Haq that those who are ignoramus of the Visualization of the aforesaid Words, they are absolutely deprived of the Marifat, Qurb, Wisaal and Mushahida of Allah Almighty.